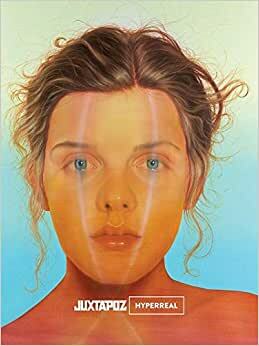 Here Juxtapoz curates a book representing a new generation of painters who have excelled at photorealism and hyperrealism, but have taken the mediums and injected them with new styles, techniques, ideas and individual personality. The resulting work is beyond categorization. With growing viewership interested in these super-realistic modes the field of artists creating high fidelity renderings is at a high water mark. The selection of works focuses on talent and technique in the figurative realm. Half a dozen works and a mini interview from each artist, including Dan Witz, Hilo Chen, Jonathon Veo, Diego Gravinese, Omar Ortiz, Jenny Morgan, Jenn Mann, Joel Rea, Alyssa Monks, Vigal Ozeri, Glennray Tutor, Ian Cumberland, Aaron Nagel, Lu Cong, Lee Price, Taisuke Mohri and Dan Voinea brings this collection to life. Its not often that you see books on realist painting that are current with a variety of styles and inspirations. Rather, books on realism often are dated quickly. This isn't the kind of book with so much text that you put it down. Its not the type of art book that you buy, look at once & never look at again (we're all guilty). I mean the kind of book that you only enjoy while reading it but don't go back to. There's a good ratio of pics to text (about a page of text to 4 pages of images). Doesn't talk about the working methods of each artist but they cover the artist statement & motivation for their choices. Good book for painters. 5.0 颗星，最多 5 颗星If you want to get a rough idea of what's in the book.. It was a delight to look through. Even though all the works in the book were done in a hyperrealistic style, there was a very good range of subjects, colour palettes, and personal tastes. I really enjoyed the book a lot. 3.0 颗星，最多 5 颗星Missing important information. There is some excellent art in this book, some of it would even be considered amazing. But there is one major flaw in the presentation - no titles, no dimensions. Some pieces are mural sized and some pieces are much smaller, but there is no differentiation or information in the book about that. 5.0 颗星，最多 5 颗星Awesome art packed in an awesome book. An awesome collection of up and coming photorealisitic artists. Juxtapoz is a big name in art and has put together a very awesome book that makes for a good gift to an art lover, or for your collection. Showcases the artists work and has a short synopsis/biography from the artists themselves. 5.0 颗星，最多 5 颗星Beautiful realism! 'Hyperreal' has a great range of artists - all representational with some more stylized than others. The book is a really good size- with full page images of artwork. A number of artists were familiar but as always, there were great discoveries.